What is it like to Nagomi Visit with a baby? 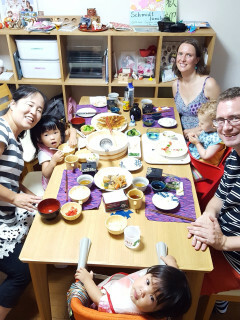 We asked Golo, Susann and their 18-month-old daughter Ida who visited Japan for the first time from Germany and decided to go on two Nagomi Visits. One in the Tokyo metropolitan area with a family of four with kids age 3 and 8 and another family of four with kids age 2 and 3 in the suburbs of Tokyo in Saitama Prefecture. Each Nagomi Visit is unique and this is Golo and his family’s Nagomi experiences. I found out about Nagomi Visit on a travel website and was immediately thrilled. My wife feels very much the same about traveling and meeting locals, so it wasn't at all difficult to convince her that we should try it out. We were both positively surprised how many answers we got following our request, and the hardest part was to actually choose but two of them. How long did it take for your daughter to warm up to the host's home and family? If so, how did they interact with the hosts? My daughter was a bit shy at that time (18 months old), so she didn't really get into contact with the kids. Instead, she played with their toys (which they gladly allowed) and kept close to Mum and Dad. She loved trying on the baby yukata our second host family provided. She also loved watching the moon from the first host family's balcony together with their daughter. Did your daughter enjoy any part of the meal the host made? When we visited Japan, temperatures peaked at about 38°C. Our daughter didn't like the heat, so she generally ate only little. 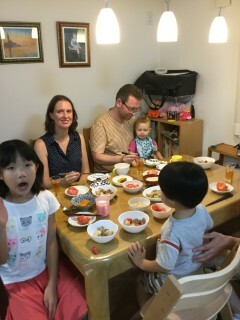 It wasn't very different at the host family, but both my wife and I enjoyed the food a lot. What was the Nagomi experience like as a parent with your daughter? It was great - I couldn't have expected more. Did having your daughter help foster conversation or help you notice things you may have not if you went with just adults? Sure. As with other German parents, you automatically start talking about your kids. The first host family allowed Ida to participate in the tea ceremony, which she enjoyed a lot. And their elder daughter was so proud helping out that you could feel that Ida wanted to do the same. Was participating in a Nagomi Visit different from other travel activities with your daughter? Was it more relaxing since you are in a home with similar age kids and toys? Or did it make you nervous? Both my wife and I have travelled widely (and also to Asian countries), so we weren't nervous. We were greeted in such a friendly way that any rest of nervousness would have disappeared immediately anyway. Both Nagomi Visits were really quite relaxing as we could get out of the heat and let our daughter play in safe surroundings. As I said above, it was more the toys than the kids she was interested in. Why did you decide to go on more than one Nagomi Visit and what did your family gain from meeting more than one Nagomi host? Our original plan was to do even more Nagomi Visits in all the places we visited, but given our limited time in Japan we were quite happy to settle on only two. With hindsight, though, we should have taken them in two different cities, though, as we missed out on two afternoons in Tokyo. Given that there is so much to see, this was not the best choice. Apart from that, both Nagomi Visits were great. 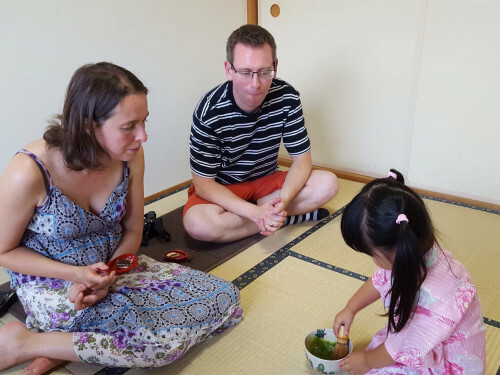 We had a lot of fun with the first family, taking pictures of the kids during the tea ceremony or creating Japanese sweets and origami on our own. The food was excellent, too. The second family was super friendly, too, and we were immediately on the same wavelength. It is always good to meet locals, so if we ever get back to Japan, we will certainly do another Nagomi Visit.